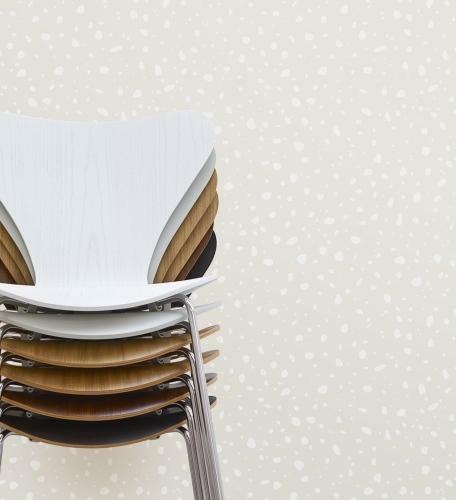 The moulded plywood Series 7 chair was developed by Arne Jacobsen in 1955 for the Danish manufacturer Fritz Hansen; and not only went on to become one of the genuine classics of modern furniture but Fritz Hansen's best selling product. The Jacobsen classic is available with a range of bases, including a bar and swivel chair version, and as Series 7 children's chair. 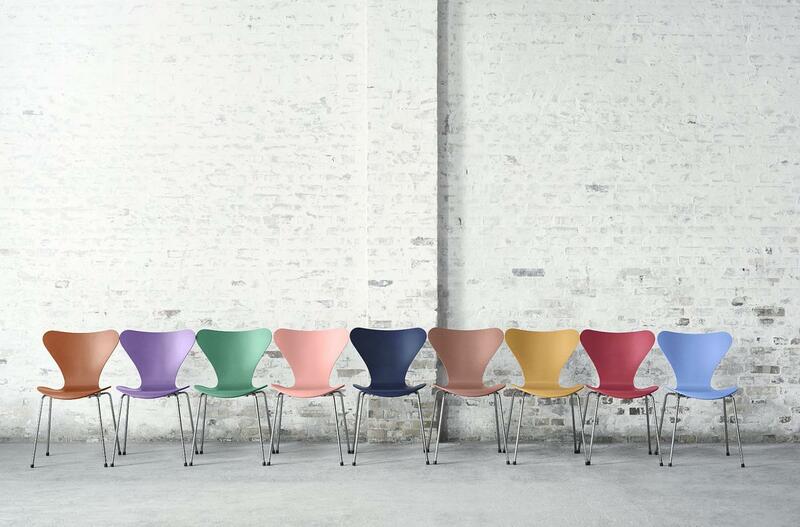 To celebrate the 60th birthday of the Series 7, artist Tal R has created wonderful new colours for the iconic chair. Each colour tells its own unique story. Care Lacquered surfaces of natural wood tolerate neither moist heat nor alcohol: all spills must therefore be wiped up immediately. When cleaning use only small amounts of water - ideally only with a damp cloth. How much and how quickly the surface acquires a patina depends on the type of wood, nature of use and exposure to sunlight. PEFC-certified for the use of wood from managed forests. Datasheet Please click on picture for detailed information (ca. 0.8 MB). Is the Series 7 chair available in other colours? 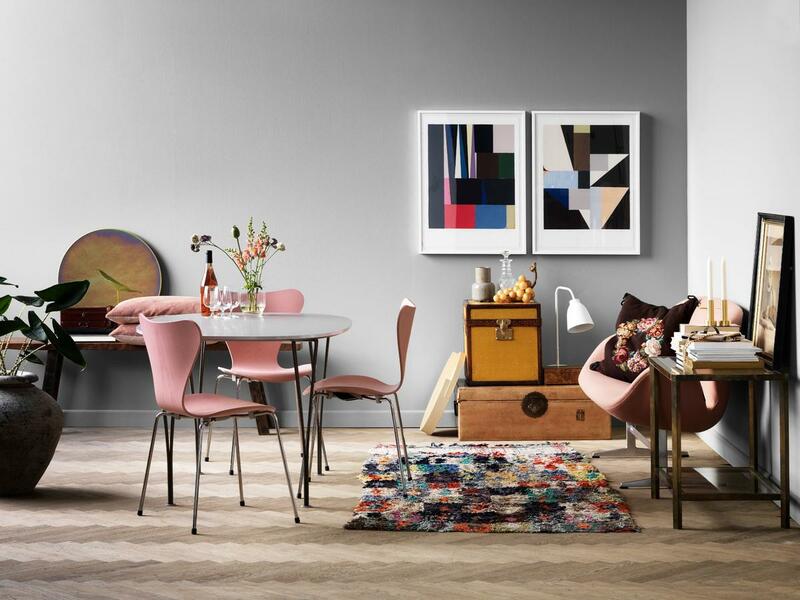 The colours and finishes are adapted by Fritz Hansen at irregular intervals depending on current developments and trends. Where did the name 3107 originate? 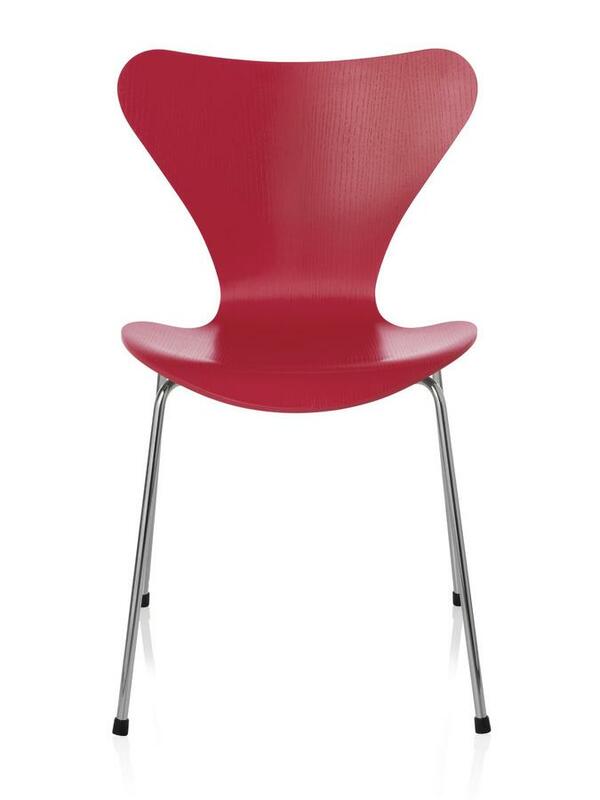 The chair 3107 is a further development of the Ant chair (3100) and is therefore also called the Series 7. One of the biggest successes of Danish furniture manufacturer Fritz Hansen is without question Arne Jacobsen's Series 7, which was developed by the designer in 1955 in context of his Ant Chair. 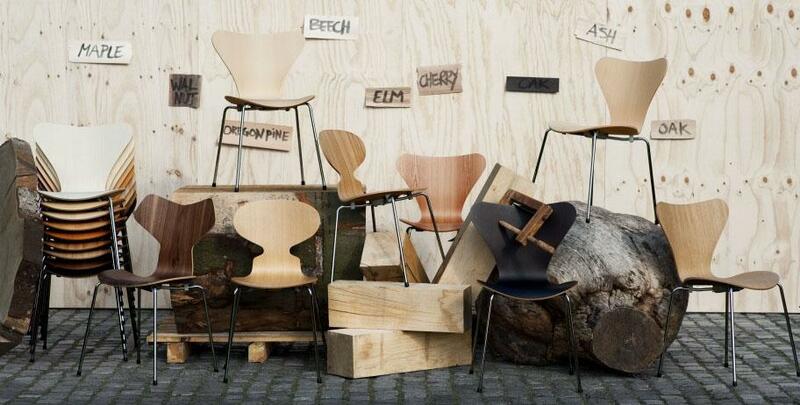 The three-legged Ant Chair did not have the expected success and so Arne Jacobsen was asked by Fritz Hansen to develop another chair made of moulded plywood - this time with four legs. 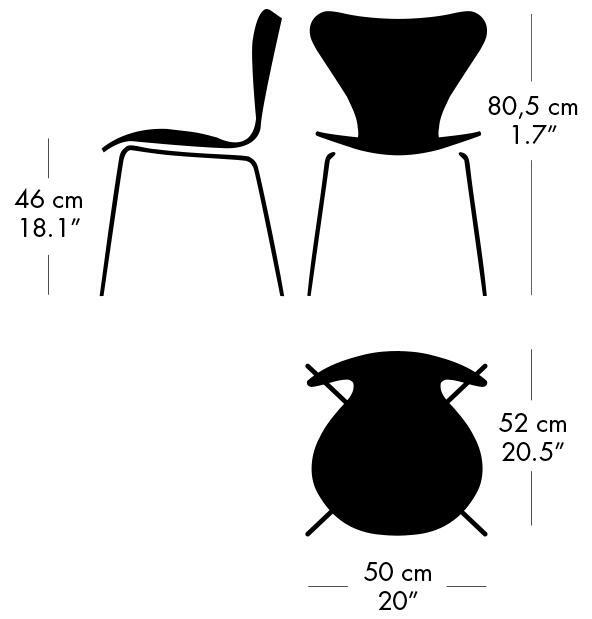 This result was the Series 7 chair that until today has sold over 5 million copies, making it the the most successful product in Fritz Hansen's history. And raising it to a genuine classic modern furniture design. Jacobsen subsequently developed a whole series, all featuring the same seat shell combined with different bases and thus created a chair family which can be used in various situations. 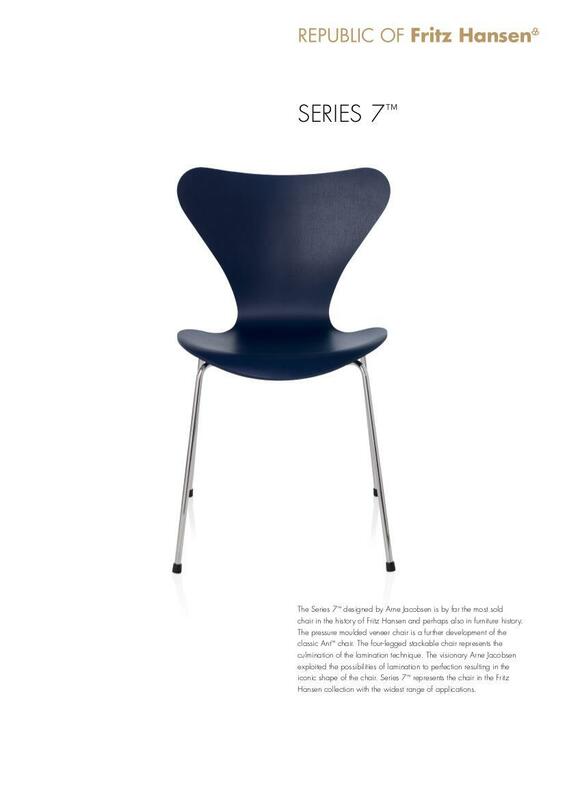 The foresightedness of the Arne Jacobsen Series 7 chair was not only the form but principally the production process of the chairs. 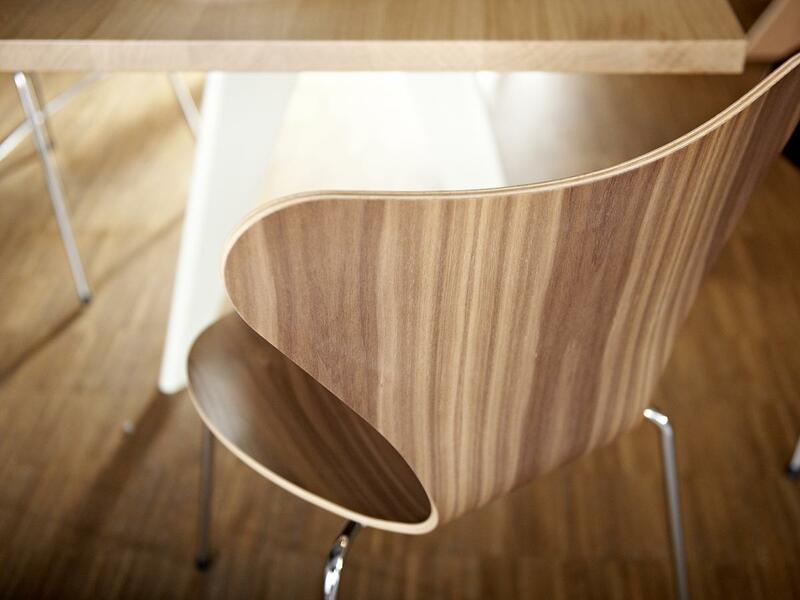 Although the lamination technique was known, it was perfected by Jacobsen and Fritz Hansen in their moulded plywood chairs: the layered glued wood structure is three-dimensionally deformed under the influence of steam. This seat and backrest of Fritz Hansen's 3107 are made from one piece, with the seat narrowing in the middle, a necessary construction decision which ultimately defines the shape of the unmistakable 3107 chair. 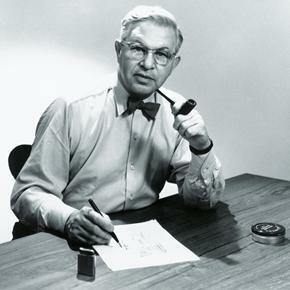 Born in Copenhagen in 1902, Arne Jacobsen is one of the most important designers of the 20th century. After completing his architectural studies at the Royal Danish Academy of Fine Arts in 1927, Jacobsen established his own studio. With his first major projects, such as the Bella Vista estate in Klampenborg, Arne Jacobsen quickly made a name for himself. The Second World War however then forced him but to flee to Sweden and only after his return could Jacobsen develop the projects that would bring him international acclaim: projects such as the Ant Chair and thereafter the Series 7. Jacobsen's other most important designs include without question The Swan and The Egg chairs, both created as part of the new building SAS Hotel in Copenhagen, for which Jacobsen not only planned the building but also designed the complete interior. Despite working largely as an architect, Arne Jacobsen is principally rememeberd today for his furniture designs, many of which belong to the genuine design icons of the twentieth century, while works such as the chair 3107 have became the epitome of Scandinavian design. 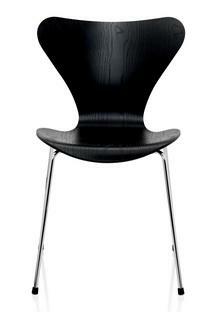 Arne Jacobsen died in 1971 in his home city, Copenhagen. 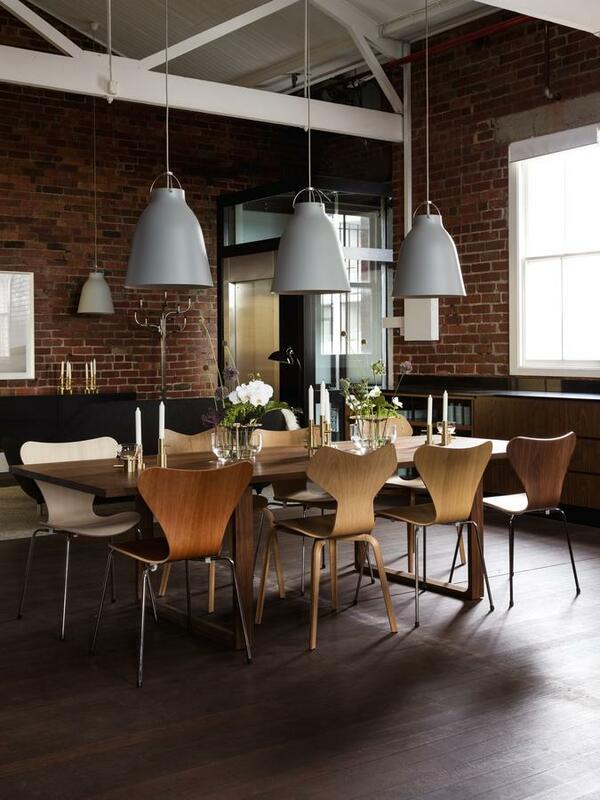 Series 7 manufacturer Republic of Fritz Hansen was founded in 1885. 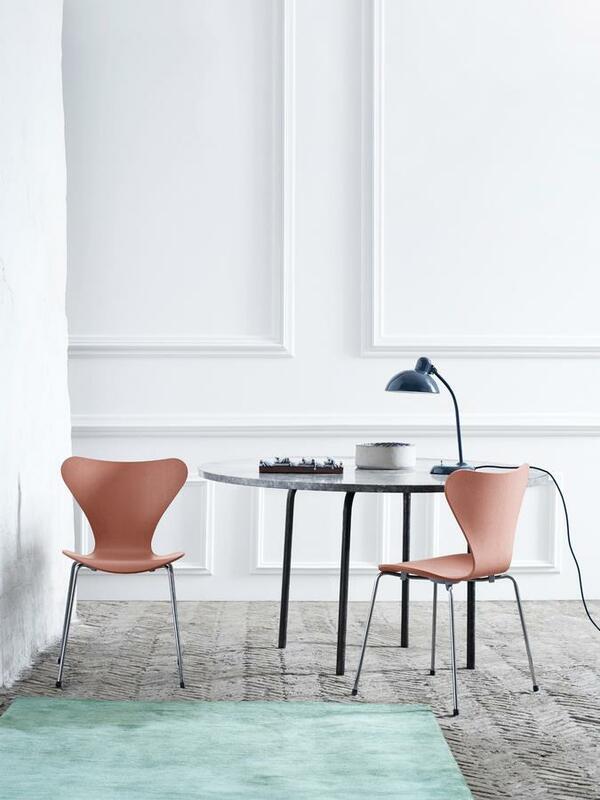 For almost 60 years Arne Jacobsen's chair 3107 has been manufactured by the Danish company Fritz Hansen in Alerod, north of Copenhagen. 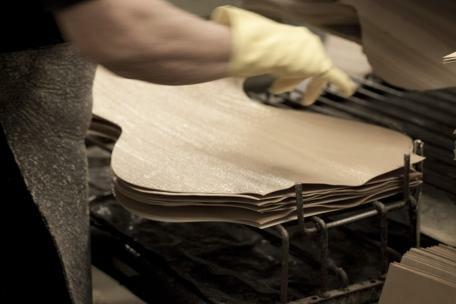 Each chair is made from a single piece of veneer cut, glued and pressed in the typical series 7 form. Subsequently, each shell is quality controlled before the respective base is added. By hand. 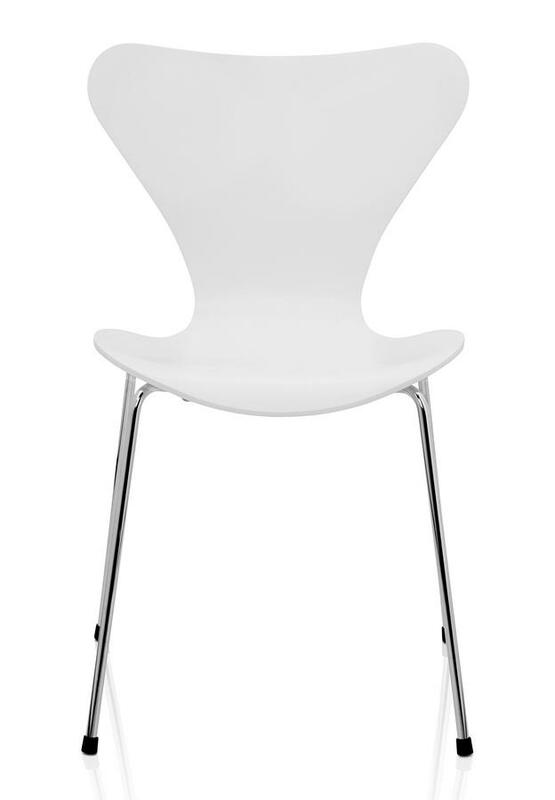 The base of the 3107 chair is stackable and available in different seat heights. 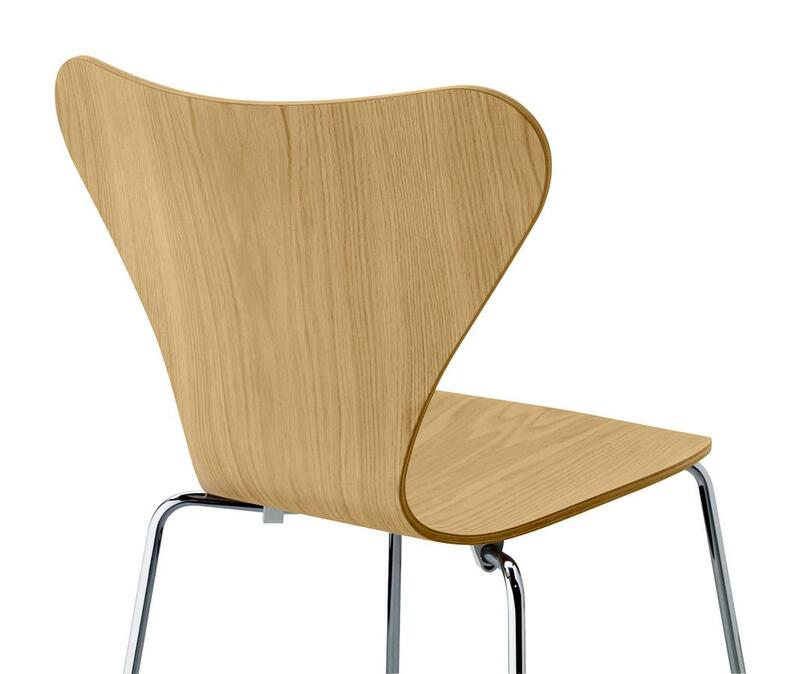 The core veneer of Fritz Hansen Series 7 seat shell is always made of beech; in addition veneers of various high quality wood are available. The Series 7 is offered in 9 different, clear lacquered woods as well as in stained ash and lacquered finishes. Quality and sustainability are major priorities for Fritz Hansen. 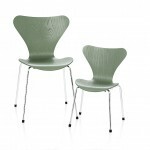 The certified environmental and quality management to which the company has committed itself is subject to regular, strict controls and is focused on the durability and high quality of Fritz Hansen chairs and to guarantee all activities of the company operate as environmentally friendly and socially responsible as possible. The design of the Series 7 chair 3107 has remained unchanged since the 1950s, the veneer designs, however, have changed over the years. Here the versions from 2012. With its clean lines, functional form and the practical approach Jacobsen took to the development, the 3107 chair is a perfect representative of the Scandinavian variant of functionalism. There functionalist approaches began in the 1920s at the Bauhaus and developed after the Second World War to become a principle movement in architecture and design. 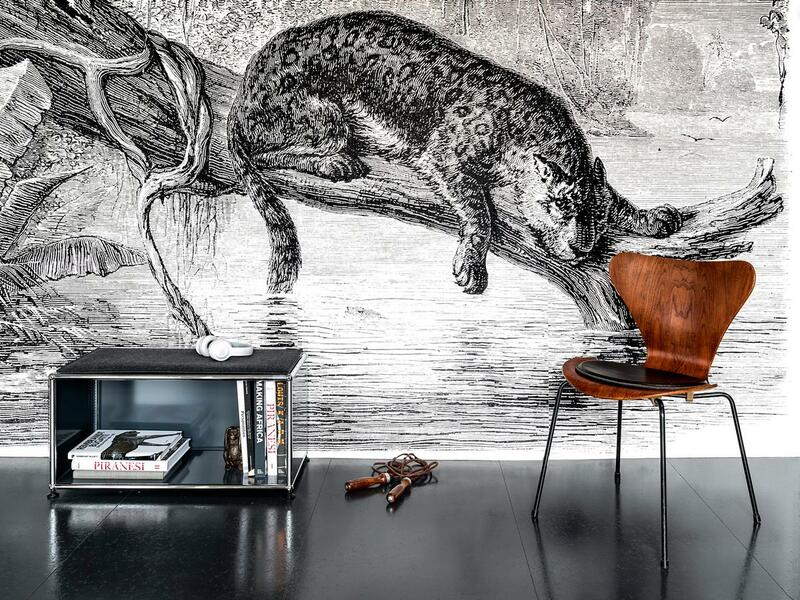 Arne Jacobsen's designs are regularly compared with the work of Le Corbusier and Mies van der Rohe, as well as that of Charles and Ray Eames. What however makes Arne Jacobsen chairs and other designs unique are their organic, warm design. With curved lines and forms borrowed from nature Jacobsen's furniture designs stand in direct contrast to his buildings, which remained rooted in the common functionalist consensus and its familiar rectangular geometric forms. Fritz Hansen, manufacturer of Arne Jacobsen chair 3107, was founded in Copenhagen in 1885 by master carpenter Fritz Hansen. In collaboration with his son Christian, Fritz Hansen was able to quickly establish a good reputation and by the 1920s many large projects could be and were being realised. Consequently under Christian Hansen's leadership the company developed in the first half of the twentieth century from a craft to an industrial operation. The cooperation with Arne Jacobsen dates back to 1934, but the success of the cooperation begins only with Jacobsen's 1952 Ant Chair design. Three years later the Series 7 chairs finally placed Arne Jacobsen and Fritz Haller in the high pantheon of furniture design. Renamed The Republic of Fritz Hansen the company currently produces an eclectic mix of designer furniture classics and contemporary designs including, for example, Hiromichi Konno's 2009 Rin chair.